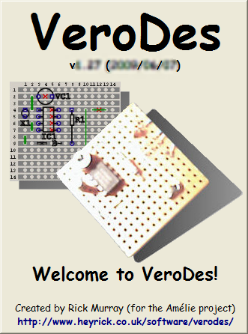 VeroDes is an easy-to-use design program for those wishing to design circuits on "veroboard"™ (also known as "stripboard"). Now veroboard is great for putting together prototype circuits, but it has one big disadvantage. Because the copper tracks are fixed, it can be a real pain to convert schematics to veroboard. I know, I�ve had to do it numerous times. This is where VeroDes comes in! Not only can you make good looking board designs � quite an improvement over diagrams scribbled onto graph paper � but you can also instruct VeroDes to print out an "overlay" of either side of the board. This can then be stuck to the board to guide you to placing components and cutting tracks. I am placing this section right at the top following a look at a few sites linking to VeroDes. Firstly, anywhere that states that the licence does not permit redistribution of this software is just plain wrong. I used to say this for early versions of the software, but now I feel that it is at a level where it may be passed around. Feel free to do so. Secondly, yes, this software does call home. THIS CAN BE TURNED OFF. Before you start screaming about your privacy, please be well aware of two things - the first is that pretty much any package that "checks for updates" is doing the exact same thing, and that the only difference between most of those and myself is that I am being completely up-front about it. The phone-home is to provide me with a basic check on how popular VeroDes is, and to provide you with immediate notification as updates are available. I cannot personally identify you from this information, and I have no wish to. But, if you still do not want to trust me, just turn off the "check for updates". Yes, it is really that simple. Create veroboard circuit designs with ease! Board sizes up to 70 holes by 70 tracks can easily be accomodated (in fact, VeroDes will go as far as 128×128). View both sides of your circuit; with links, breaks, and component pins clearly marked in either view. Here is the top, component, side of the board. This is probably how you will use VeroDes most of the time. Here is the bottom, copper, side of the board. This will be useful for placing track breaks (you can place those in the other view too!) and for checking the board without the clutter of the component side view. Print the circuit in a variety of ways. Perhaps you wish to look over your design as it appears on screen (as above) without the tiring effects of staring closely at the screen. No problem! You can also draw on, mark off, or make notes on a paper copy! Perhaps you'd like to print a 'template' so that you may rough out your design before working on it in VeroDes? No problem! VeroDes can print a template sheet that is around 5/6ths larger than actual veroboard; so it is big enough to work with easily, yet covers enough board space to be useful. You should be able to print around 90 holes by 55 tracks (depending on the margins of your printer) onto a piece of A4. The above document was printed to a PDF generator directly from VeroDes. How above going for the whole "Blue Peter" vibe and printing out an overlay of either side of the board, precisely matched to the board scale, so you can Pritt-Stick™ it to your board and know exactly where to place your holes, links, and components? Say it with me: No problem! The above picture is not very good as the display bitmap offers a resolution of 96dpi. Printing this to a printer that can achieve better, 300dpi at least (which is most printers!) will produce much nicer results. This picture is only an example so you can see what I mean. There are lots of useful little features. For example, in the picture below we have asked VeroDes to highlight everything that is directly connected to the GND pin. You will notice that it has followed a wire link too, of course. If you think the magenta is too garish for words, you'll be pleased to know that you can tweak the colours as you see fit. Perhaps highlighting would be better in brown... or Hello Kitty™ bright pink? Your choice! 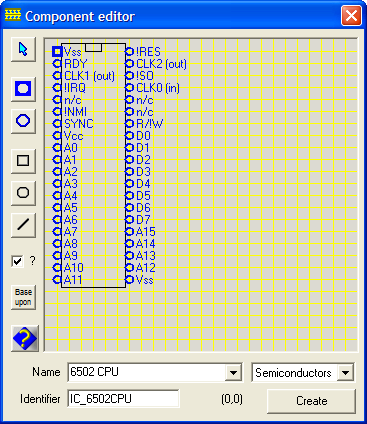 For the more advanced, you can create your own components, up to 25 pins by 25 pins (dimensions, or up to 600 pins in total) along with lines and rectangles and circles for drawing the component 'body'. You can easily share your designs with others, including any custom components that you design. For the geekier among you, board files are textual 'descriptions' which may be read, edited, or created in a text editor. The specification is completely documented in the help file. You can read an example file if you like! This software may not be as full-featured as some, but on the other hand it is free. No longer reports "Save error: Path/File access error" if you click on the save button. If there is no current board filename, you will now be asked for it. Fixed a bug/quirk where there were two config options to turn off the in-editor help. The second one, actually, was to control the tooltips, but the message tag was wrong so it was loading incorrect info. Does this version of VeroDes "call home"? Yes, but you can disable this if you want. Simply configure it not to. However, please read the specifics of this before disabling it. When I design new components, ones already placed on the board seem to randomly change! This is a fairly major problem that affected all versions prior to (and including) v1.30, but did not get spotted earlier as, in questioning users, it was common to design the components and then the board. SOLUTION: Upgrade to the latest version of VeroDes. If my board is 15×20, I can't click beyond 15×15. Can I change a component's rotation? No. Delete it and place a new copy of it, with the desired rotation. What gives - how do I delete stuff? Right-click a component's pin, it will appear in magenta. You can now use the cursors (up/down/left/right arrows) to move the component around, or you can press DELete to erase the selected component from the board. If you find the "Are you sure?" prompts annoying, use SHIFT DELete to remove things without the prompting. How do I unhighlight something? Why are left and right rotations in lighter grey? I can place components under other components! It takes a little more care to build a board in this way, but it can lead to usefully more compact designs. VeroDes keeps asking me if I wish to overwrite existing components whenever I load up my project. This is a design feature - because extracted components would overwrite ones currently installed on your system with the same component ID. You can select a configuration option to not overwrite existing files. In this case, the version(s) held in the board file will be silently discarded and the existing version(s) loaded instead. VeroDes reports "Run Time Error '70': Permission Denied" when trying to place a component...? This is a problem with Vista's UAC. Windows 95 OSR 2 or later. Earlier (16 bit) versions will not work, at all. You may need my various dependencies pack. This is linked below, after the software download. If you have any of my other software installed (i.e. Alarm, TechnikaTweak, WinTTX, VideoList2, etc etc) then you probably won't need this. About 1Mb of space on your harddisc (plus ~4Mb if you need the dependencies). A display of 800×600 in 256 colours, or better. Also a mouse or touchpad. Hands up anybody stuck in the eighties with a VGA 640×480? That's nobody? Thought so! Windows looks pretty awful in only 16 colours. Note, also, that everything that prompts you "there is an update available" is doing the exact same thing. The only difference here is that I am documenting the process. Latest VeroDes distribution. Self-installing .EXE file, just download it and run it. Follow the on-screen instructions. then you need to download and install the Various Dependencies, 3,240K.